Holocaust Survivors: Photo Gallery - "Auschwitz Record of Buna Quarantine"
This is an original document from the archives of the National Museum of Auschwitz-Birkenau which lists the name of prisoner Solomon Radasky (Slama Radosinski) Auschwitz No. 128232. 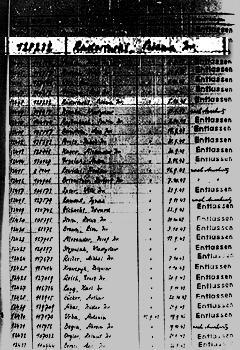 It documents Mr. Radasky's arrival at Auschwitz and his quarantine prior to starting work at Auschwitz-Buna. Buna or Auschwitz III was a vast labor camp dedicated to the manufactuing of synthetic rubber. Despite a monumental effort, deliberate cruelty and the murder of thousands of slave laborers no industrial quantity of synthetic rubber was ever produced at Buna.